Posted on March 15th, 2010 by ploughmyfield. Fitting a Midland Industries Limited (MIL) Model H Loader to a Ferguson tractor. So this is what it should look like when it’s all assembled and working. This fine axample of a MIL loader belongs to James at Rhodds’s Farm. It is fitted to a TE-F20. Speaking to James he bought the tractor with the loader already attached. This is the best way to buy a loader in my opinion as all the parts should be there. Beamish Museum have bought a MIL Loader. 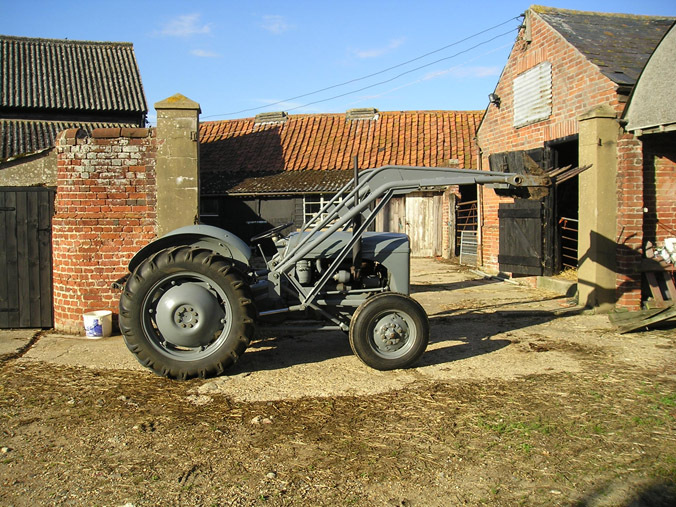 The idea is to make the Ferguson tractor they have more useful by fitting the loader to it. The Ferguson TE-A20 tractor they have although converted to TVO has an engine built by the Standard motor company, this is important as you will find out later. So I went up to Durham to look at the pieces they have and see if the loader could be assembled. Before I went up north I looked on the internet for an instruction manual, I could not find one. So the helpful people on the FOFH forum came to my rescue. I was kindly sent this 4 page document which after a little reading you will see gives you all the information needed. Most interesting was the parts list and exploded diagram. Many thanks to Gary Downes who owns the original document and very kindly has allowed me to have this downloadable copy on this page. With all the parts laid out on the floor in the shed I could see not all the parts where right. I forgot to take any more pictures of the MIL loader so you’ll have to take my work for it. From the diagram below you will see items 73, 74 where included in the loader. Now looking further these items are for a Diesel model. I was trying to fit this to a petrol/TVO and should be using items 5, 6. Also from the parts I had items 30, 31. These brackets where home made and I couldn’t make them fit the tractor. Maybe the loader was originally fitted to a Diesel as the items 30, 31 would have been replaced by 85, 86 for the diesel model. 4 longer bolts (5/8″ UNF x 6 1/2″ Long) to attach the frame to the trumpet housing and then the mudguards on top. 4 bolts (5/8″ UNF x 3 1/2″ Long) to attach the brackets to the front of the engine. So with limited tools available I didn’t do much that day other than, start the tractor up and run it for a bit then inflate a flat front tyre. First task then was to make up some brackets item 30, 31 to fit to the tractor. This didn’t prove too difficult and I’d like to thank Bob Nix for the dimensions to make the brackets. I’ve produced a drawing here so anyone else wanting to make some can. It should be pretty self explanatory. Here again courtesy of Bob Nix is a picture of what the brackets and spacer look like in place. I still have more info to add to this page and need to sort out………. The control valve isn’t original on the beamish tractor (it’s Painted Blue and has a lever instead of a handle) and I don’t have a connector to screw into the front corner of the hydraulics housing onthe tractor. So this is what the original valve, pipework and connector all look like. Thanks here to Chrostopher Smith for supplying these photo’s. He just happened to have an old MIL loader lying around that he had removed form a TE-D20 he was restoring and kindly offered to take some pictures for this article. Thanks Christopher. Here you see the Valve with shut off tap that bolts in front of the seat. the pipe attached goes down the side of the gearbox casing to the front corner of the hydraulic pump. This view shows an up close view of the valve and bracket. it is slotted so you don’t have to completely remove the bolts holding the casings together. just slacken the bolts slot in the bracket then tighten them up. Very well thought about. Another shot of the valve from the side. And here is the connector that screws into the tractor’s Hydraulics. Christopher Thinks the thread is 1/2″ BSF. I’ll confirm this once I have a connector. I need to buy some 5/8″ UNF bolts for the mudguards and also to attach the front brackets in place. I also need to see if the Diesel brackets items 73,74 will work on a TE-A 20 engine. I’ll keep you all posted. please feel free to add comments the more the better. Below are links to videos of me fitting a MIL loader to a tractor at Beamish museum. You will also need a T-Bar for the back of your tractor. The T-Bar locks the lower link arms and stops them from reaching there maximum height. This has a knock on effect of not then allowing the hydraulics inside the tractor to dump the fluid under pressure back into the reservoir and the pressurised fluid passes up into the MIL valve mounted in front of the drivers seat. It is also a good idea to have a heavy load attached to the back of the tractor to stop the back end from lifting. I found on the Grey Fergie Forum these plans to make an original ferguson concrete block. you will need to supply the steel hook shape and the concrete after making the box. http://www.rhoddssfarm.co.uk/loader.htm James’s MIL Loader page, Lots of great pics. I’d love to see more pictures of the control valve and closer on how the frame is fixed in place. And Finally the mystery bracket. Leave a comment if you think you know what it is. I thought maybe Mil’s version of the T-Bar to lock the lower link arms below top position? First my sincere apologies for not giving you the credit you truly deserve. Without people like you this site would be nothing. I think the confusion came as I had the same pages sent by Bob Nix from the forum. You must have sent a copy to him. I did not fully appreciate it was your original copy. I have updated the website and hope it meets with your approval. I would not want to upset the relationship I have built up with contributing fellow enthusiasts as the website would be a poorer site. p.s. a hydraulics manual for what? Excellent page… But i’ve just fitted a MIL Loader to a TED 20 and the damn thing won’t push the MIL Loader up unless the rear lift arms are down…. So if you put some weight on the rear lift arms… it raises! But as soon as the rear MIL Loader has lifted to full height the rear lift arms push up and then the MIL loader looses pressure. I put a draw bar and stays on the rear lift arms and it’s just bent them once it finished raising the lift arms at the rear… Any thoughts? It sound as though all is working correctly you just forgot one thing. You need a t-bar to make the arms lift. The t-bar stops the lower link arms from lifting fully. If the link arms reach the fully raised position the hydraulic fluid is dumped out back to the tank and no pressure will ever be raised. I have been fitting a MIL loader on a friends TED20 today and found that the front brackets fitted straight on without the spacers shown in one of the pictures (we did not have any with the loader supplied) so i cannot see what advantage they give you if fitted, surely, a stronger attachment is given without them, i noticed also that the curved section is adjustable if you need to move them backwards or forwards to line up with the engine bracket,if i could workout how to upload a picture i can show you the finished loader.Regards John. Roger, Störlinge Borgholm Öland Sweden. Hi, fantastic site – well done. I am fitting a MIL loader to my diesel TEF-20 but and in a similar position to you: I dont have the front brackets and need to make some up. I don’t suppose you have any photos of the 2 sets of front brackets or the diemensions? Hi, does anyone know roughly what the lift capacity of a mil loader on a TE20 is? Recently bought a TE20 with MIL loader fitted. I’m losing a lot of hydraulic fluid out of one of the pistons. I’m assuming a piston seal has perished and therefore leaking. Any idea of where to get new seals from? Silver fox tractors do seal repair kits for banana loaders. Do you think this will be compatable? Thanks for getting in touch. No I don’t think the Banana loader kit will fit. If you can find a local Seal/ Bearing supplier take the dismantled and cleaned up piston in and see what they say. You did see the parts list to download on the MIL loader page? was it any help. look for some more rams on eBay? Great topic now I have or am about to commit to a Massey Ferguson 735 loader which will fit my TE20 with a modification bracket. The spar that runs left to right under the fe35 is fixed to casting threads under transmission housing, but my fergie needs a bracket which fits I think to front of trans housing and rear of it then the spar just bolts to the bracket. Does anyone have one? Or any plans around to manufacture it? Hi Daz grassick, I’m facing the same problem, I have a te20 and a 735 loader and am trying to combine them. Did you find out more about solving this puzzle? Fantastic page, thank you all for the info. I have a Mil loader for my TED but both Rams are scrap, well one is without doubt, does anyone have any spare ones or know where I could find some. I was wondering where you came by the hydraulic connector. I am fitting a mil loader and mine is missing. Any idea where I could get one? Hi. I remember when I fitted my MIL loader brackets to rear axle I had to also alter wheel settings to stop the tyres rubbing on the frame. Is there an easy way to connect loader as it has to be supported to clear front beam axle then manually lifted onto frame, are there any supports that allows it to stand clear of the axle and wide enough to clear the front wheels then maybe able to lower onto frame? At the moment it takes lots of levering. Hi, I recently got my 2 rams serviced, it is possible to get new ones made if you have all the ends, I do have some spare rams, but they will need an overhaul, from time to time I see them on ebay.Do you know of anyone who has fitted a double acting ram to the bucket / grape ? I am doing this, but need some guidance on the hydraulics layout. That needs a new Home – I live in South Wales would really appreciate an e-mail!! Hi, sorry I cant help with a loader, but I suggest you put an advert in one of the classic tractor mags, I always get a good response from ads in them. I have seen loader assemblys in ebay from time to time. Nick, funnily enough I have the loader you need! Mine was removed as Rams were scrap. Someone left them out for 15 years! The link for the PDF of the bracket measurements seems broken. Is there another download or does anyone want to swap my set of Diesel brackets for the standard engine brackets as shown in the drawing? Do you still have the loader – I am still without and missing it !! I would appreciate if you e- mailed me directly as it took me along time to find your reply! Sorry again I should have sent a thank you to Dave and my previous mail to James ! !